We're so excited to introduce Float and Flow at SYNC, in partnership with Soft Body Yoga! Part float session, part gentle flow yoga class, Float and Flow pairs two powerful therapies to relax body and mind. The evening consists of two groups: those floating then flowing and those flowing then floating. Both groups share the small-group 45-minute yoga practice together. No matter which activity you do first, you can expect each to enhance the experience of the other. No experience for either is required. 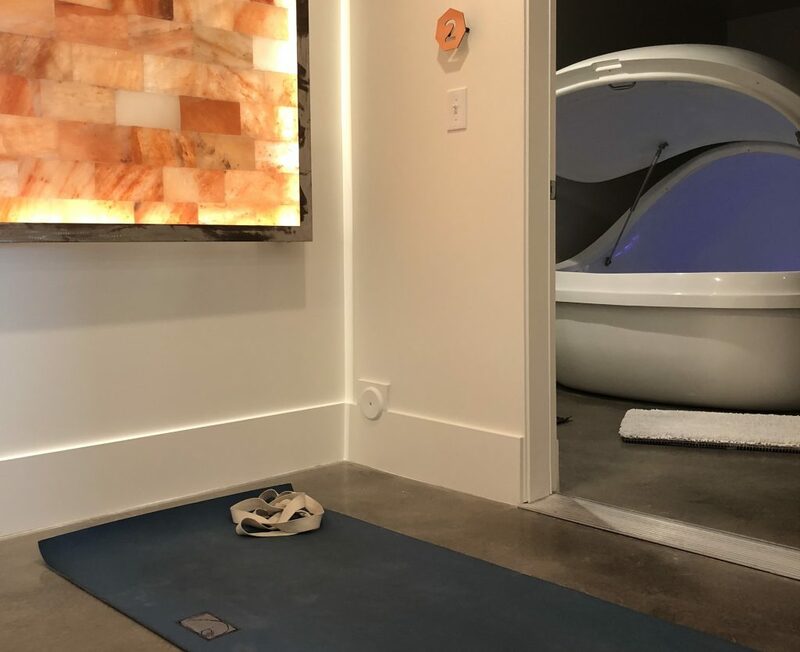 We walk you through your float if it's your first time, and Betty meets you right where you are in your yoga practice. So many kind and generous people walk through the doors at SYNC, and Betty from Soft Body Yoga is one of them. Our partnership developed quite naturally through post-float conversation. We all want to support our communities through wellness practices. We know you'll love Betty as much as we do! "I got into teaching yoga because I was working at the Baptiste Institute and ended up at a Level One teacher training in October 2011. I saw in my own body how powerful the practice was and I wanted to share it with others, so I began teaching in January 2012. I went on to complete my Level Two and thus my 200 hours certification through the Baptiste Institute in April 2014, 36 weeks pregnant! I guess you could say I’m unconventional. I invite you to come as you are and always be innocent and gentle with your practice. I look forward to empowering you, body, mind, and soul in the practice of union—yoga!" Float And Flow With Us! "Calming the mind is yoga. Not just standing on the head." Yoga and floating are very similar, yet obviously pretty different. When I get trapped in my mind, either one helps free me from my obsessive thoughts. They get me to focus on feeling my body instead. I leave both practices with loosened muscles and a calm mind. Putting the two together enhances the experience of both. Our first event is Thursday, March 29th—either float then flow (4:30P-7P) or flow then float (6:15P-830P). Cost is $79 per non-member and $69 per member. Members with available float credits can opt to use a credit and pay only $20! Bring a mat, block, and strap if you have them. Please reserve and pre-pay via info@syncfloat.com or 435.333.7962. Space is limited to three participants per time slot, so don't dally! If you can't make the March event, our second session is scheduled for April 26th with more dates to come. Put on your comfies and come join us in these amazing nights of active relaxation! Want to learn more? We're always blathering about on Instagram, Facebook, and Twitter! And if you really want to immerse yourself in all things floating, we've also got plenty to say over on our library page!